Recently we had a stand in the Buy Local Norfolk tent at The Royal Norfolk Show, which was a fantastic, although tiring coupe of days. Our main aim was to raise awareness of the work we are doing and we were definitely able to do this. 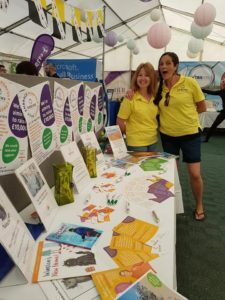 Here is a fun picture of Emma and Hayley with the stand, we had some lovely posters kindly donated by Glen Manship of Red Hot Media, thank you, it made all the difference to our stand and really helped to raise awareness, especially for the walk. Lots of people showed interest in the walk, wanting to know how to get involved, we were given some donations, pledges of support for the walk itself and lots of positive interest. Our founder Emma did a short talk in the evening, again raising more awareness of why we do what we do and what we plan to achieve, it really touched a lot of people in the room and sparked even more interest. 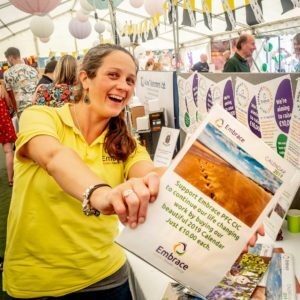 Thank you to Chris Ball of GGS for this lovely picture of Emma promoting our beautiful 2019 calendars which are also raising money for Embrace PFC CIC, all proceeds from the walk and the calendars goes directly to supporting people.